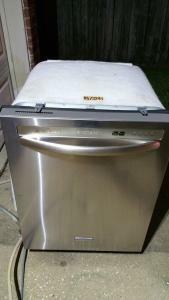 Kitchen aid dishwasher repair in Houston area. Soap dispenser does not operate. Discovered melted down solenoid on dispenser and burnt down triac on main control board. Call or text 832-428-8789 for reliable repairs and diagnostics.